Where form meets functionality, there's Symmetry. 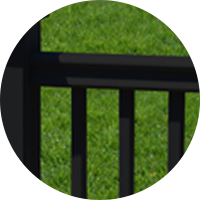 Whether on a deck or a porch, Symmetry Railing provides the ideal balance of great looks and lasting performance. The soft satin finish is elegant yet incredibly durable. A sculpted top rail adds classic style, while hidden hardware keeps the look clean and uncluttered. Three rich colors and two baluster choices create multiple design options. Best of all, the smart composite construction and protective bonded cap layer eliminate work and worries. Sit back and enjoy the view. 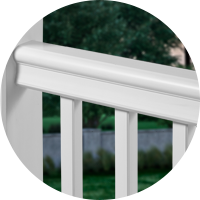 Symmetry Railing is available with matching beveled square balusters in either 29.5" or 35.5" lengths. Available in Serene Black, Simply Brown, and Tranquil White. 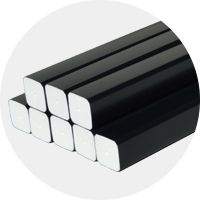 SymmetryRailing is available with a black aluminum baluster. 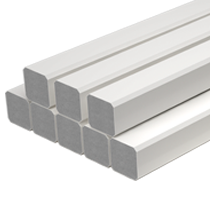 Available in 29.5-inch lengths and 35.5-inch lengths for railing lines and 30-inch and 36-inch lengths for stairs. 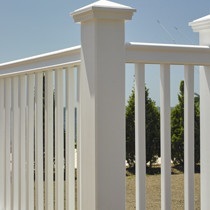 Rail kits include solid, beveled-edge, square balusters in either 29.5" or 35.5" lengths. 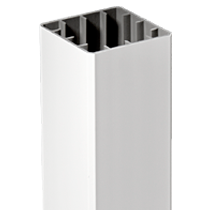 Corrosion-resistant aluminum with powder-coated finish. Diameter is .75 inches. 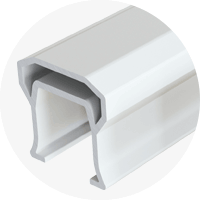 Available in 29.5-inch lengths and 35.5-inch lengths for 36-inch and 42-inch railing line installations. 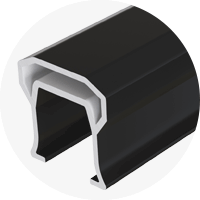 Available in 30-inch and 36-inch lengths for 36-inch and 42-inch stair installations. 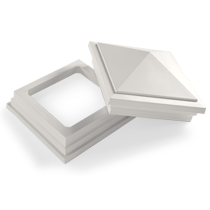 The Symmetry crush block assembly includes a short section of Symmetry 1 ¼" square baluster, one adapter, and three screws. The adapter works with both line and stair applications. Post Sleeve Surface Mount Kit with 4 x 4 wood insert. 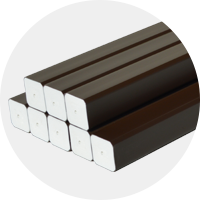 Available by special order in white, black, and brown (gloss finish). Sold in two distinct kits. 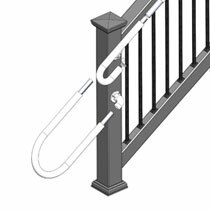 ADA Handrail line kit includes: handrail bracket kit; 104 in. x 1-1/2 in. 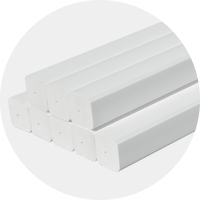 handrail with stiffener; 2 wall return kits with joiners and covers; 6 #12 x 2-1/2 in. screws; 2 joint rings; 3/8 in. x 2-1/2 in. lag screw; 2 straight joiners; and 2 #2 x 1 in. screws. 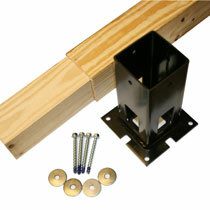 ADA Loop Return Kit includes 4 handrail bracket kits; 2 1-1/2 in. O.D. handrail end loops; 2 adjustable joiners; 2 ADA rail end caps; and 4 3/8 in. x 2-1/2 in. lag screws. 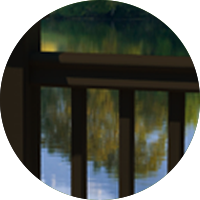 Symmetry Railing is backed by a 25-year limited, performance warranty. See complete details. Available in line or stair lengths of 6 ft., and 8 ft.
Top Rail Dimensions: 2.95 in. x 2.95 in. Bottom Rail Dimensions: 2.50 in. x 2.00 in.